It can Mega Evolve. I have played around with a Scarfed non-Mega Blastoise a bit, and seen a friend take it to a tournament. I wouldn’t recommend it… If you’re using Blastoise, you should be planning to make it your Mega. Blastoise has two somewhat irrelevant Abilities! Rain Dish is slightly better with the idea that you might bring Blastoise against a rain team while using an alternate Mega, and therefore recover HP. Torrent is pretty useless as I would generally recommend Water Spout on Blastoise sets as the only water move, meaning that by the time Torrent kicks in, it’s only going to boost a rather weak Water Spout. But neither really matters because Blastoise is going to get Mega Launcher as it evolves! First we’ll go over a more basic Blastoise. This spread hits 143 speed with Timid, or 130 speed with Modest at level 50. Timid (143) will outspeed 252+ Smeargles, and often Pokemon settling around that benchmark. Modest (130) is faster than things like max speed non-scarfed Tyranitar. That said, these speed stats aren’t really targeting anything in particular as far as threats go. The idea is just to be as fast as possible so you can Water Spout before other things. Blastoise pairs really well with redirection, allowing it to fire impressive Water Spouts unimpeded. Blastoise can also deal heavy damage to Mega Kangaskhan with Aura Sphere, but will rarely OHKO (12.5% vs. 4HP M-Kanga). Ice Beam is just there to deal with Ice-weak dragons which are OHKO’d. Blastoise’s bulk is one of its desirable traits for this job, as it will tank most anything and fire back for heavy damage. 244 SpA also OHKO’s common Hydreigon spreads, and is the same calc against 4 HP M-Kanga as 252 SpA. This Blastoise is more Special Defense-minded. The EV’s allow you to survive a Specs Hydreigon Draco Meteor 100% of the time which means you’re safe to KO back with Aura Sphere. Water Pulse is my choice here as you’re more likely planning to take a hit and fire back with this set, which means Water Spout isn’t as useful. After Mega Launcher, Water Pulse is effectively a STAB base 90 Water move with a 20% confuse chance. This OHKO’s Rotom-H 100% of the time unless they’re very specially bulky. With 28 Speed Blastoise hits 102 speed, which speed creeps all the 4 Spe base 80 Pokemon (e.g. Venusaur, Goodra, Mamoswine, Gardevoir, Chandelure etc…). The next worthwhile speed stat to try and outspeed is Rotom-A at 106, but Rotom speeds are so variable and rarely near the minimum that this isn’t going to be worthwhile in many situations. Not to mention, the ones that are minimum speed you have to approach cautiously anyways. You can’t hit 103 Speed while still surviving Hydreigon 100%, so 102 is where I left it at (though feel free to give up the 100% survive here for an extra speed point or two). To go physically defensive, a simple 252 HP / 244 SpA / 12 SDef spread actually survives Hydreigon’s Draco Meteor as well, while giving you more physical bulk by virtue of HP. But this gives up on outspeeding the 4 Spe base 80s, of which there is a fair list of. And of course, as you may wind up taking some damage (but not tons) before firing off a Water Spout, it’s nice to have Modest for that extra power, though these situations are too complicated for me to simulate for you. Timid lets you go first more often against things like most Adamant Kangaskhan, but it’s a guessing game. Timid will still let you OHKO things that are weak to your attacks though. I don’t know of any notable OHKO-2HKO differences between Modest and Timid for super effective Water Spouts, Ice Beams and Aura Spheres. The real reason to use Timid is just to outspeed a variety of middling mons. With Modest, you can’t be as sure of what you’re going to outspeed. Additionally, you may face things you could have outsped, and attacked first. If exchanges are going to end in 2HKO’s anyways, Timid is preferred because you’ll be the one going first (hopefully). M-Blastoise often 2HKOs things, so this is a pretty reasonable consideration. As I mentioned earlier, redirection from partners like Amoonguss or Smeargle is appreciated. Pachirisu also exists, but I haven’t found it as effective. Amoonguss resists both Electric and Grass, which Blastoise appreciates greatly. In return, Blastoise can threaten Rotom-H and Talonflame with Water Spout / Water Pulse to help out Amoonguss. Smeargle is infamous for being a pest and a member of Randy’s 2014 Blastoise/Smeargle team. As Smeargle threatens its own conditions, dealing with a Water Spout and/or a Dark Void is often difficult to do, making the two a threatening lead combo. Blastoise isn’t the fastest mon in the game either, and as such appreciates Thunder Wave support as a backup plan when redirection isn’t a wise option to bring. Zapdos makes for a bulky mon that can switch in on Electric/Grass attacks and support the team with Thunder Wave. Pachirisu offers both Nuzzle and Follow Me, which is why on paper it sounds like a great option, but I’ve found it to be underwhelming. Blastoise’s lower speed also offers the potential for a Trick Room set, but Trick Room hasn’t been as prominent this year. Against spreads running Water Spout / Aura Sphere / Ice Beam, Pokemon like Aegislash can wall Blastoise as long as it’s taken damage and can’t hit hard with Water Spout. 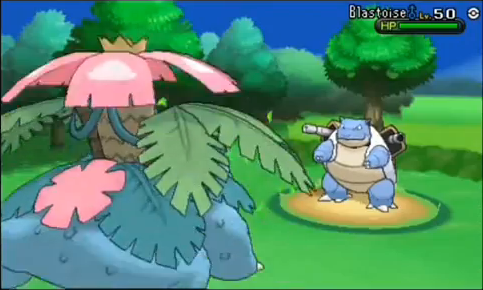 Mega Venusaur has no problem facing Blastoise, and appreciates the chance for HP recovery. Blastoise also can’t really do much to Azumarill, which opens up a Belly Drum opportunity on their side. I think the topic of checks and counters is novel with Blastoise though, as it often doesn’t quite pick up the KO’s you want without support, and as such most things aren’t countered by it. At the same time, it survives most of the stuff you can throw at it, so it usually gets to do something. As such, a simple way to put things is that Blastoise doesn’t usually win duels against faster Pokemon, as you’re often trading 2HKO’s. Blastoise relies on effective partnering to allow it to fill its role as a general threat. I have this weird sentiment about Blastoise. I’ve played a bunch with Randy’s Blastoise / Smeargle team, and tried some alternate team ideas with it, and I always come away with this sense of mediocrity. It never quite pulls off the things I want it to, and I often find myself thinking “ugh, I’m slower so I can’t go about things this way.” And yet it wins. There’s just something there that works when it comes down to prediction and warring with 2HKO’s. Blastoise relies heavily on bringing partners that patch up your field position. But when you do, things just work themselves out.